Sew Your Own Valentines Teddy Bears – Cupid Wings Felt Pattern! I’ve been sewing these adorable Valentine’s Teddy Bears with cupid wings and hearts all week long! The bears look so perfectly sweet with these wings! How cute are these bears!?? You can make your own by pairing this free wings and hearts pattern with the Fuzzy Teddy Bear pattern here on the website! No time to sew? Check out my Etsy shop! I’ll be adding these bears for sale just in time to ship before the holiday. I’m loving this cupid wings and heart pattern because not only does it create a perfectly angelic teddy bear, but you could use them on so many other DelilahIris felt animal and doll patterns. Create Valentines cupids and winged creations of all kinds with my free PDF felt pattern. 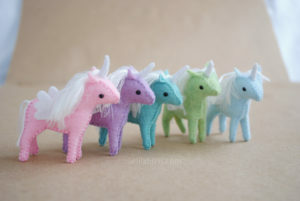 I think it would pair perfectly with the miniature felt unicorn pattern, pig pattern, elephant pattern or any of the mini doll patterns! « Make Your Own Fuzzy Fleece Mini Teddy Bears!